On-boarding, How to Select your Timezone and How to Change it. Most AirPOS users are in the 'GMT + 00:00' time zone. 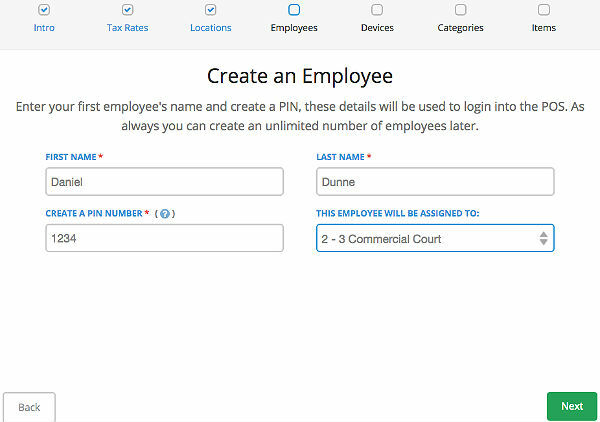 When you first sign up you'll be taken through a process we call on-boarding in which you select a tax rate, name your location, setup your first employee and till device, create your first category and your first item and select your time zone which will be based on your location. The first screen that you'll see is like the following image where you enter a company name, email address and create a password. When you press the 'Sign Up' button you'll see the following screen in which you'll be asked for your business type. Just click or tap in that box to expand a dropdown list. 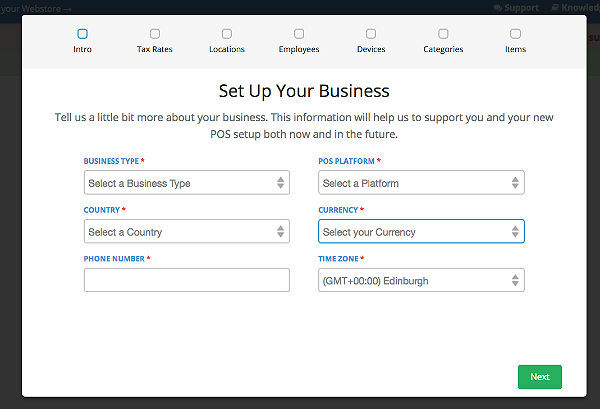 Select your country from a dropdown list and your POS platform. 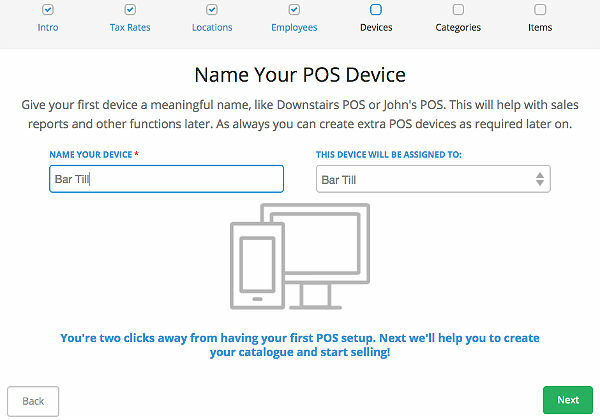 This is the operating system for your POS software and will be iOS, for iPad, Android or Windows. In the currency box the available currencies are those supported by PayPal. If you click in the box you'll see the dropdown list of available currencies. The currency symbol is not printed on receipts and will only be visible on the POS and in the backoffice to the user. If your currency is not in the list you can select 'US Dollars' or 'Pounds Sterling' as a generic symbol. Finally select your Timezone from the dropdown list and press 'Next'. 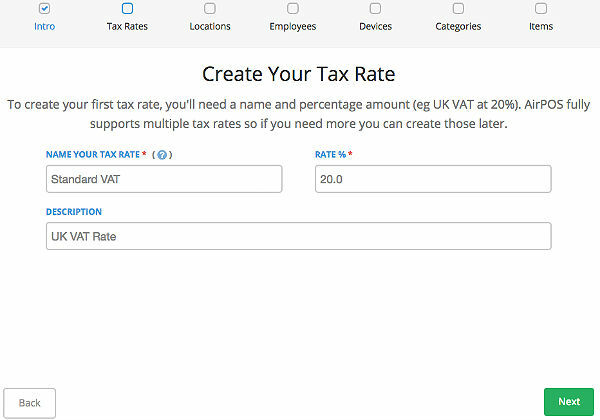 This will bring you to a screen where you setup your tax rates. The default is 'UK VAT Rate' which is standard VAT at 20% but this can be changed. When you've created your tax rates press the next button. You can edit this or add more tax rates later. In the next screen you'll set up your first employee, usually yourself. Just enter their name, give them a PIN number to log on to the till, assign them to a location and press 'Next'. 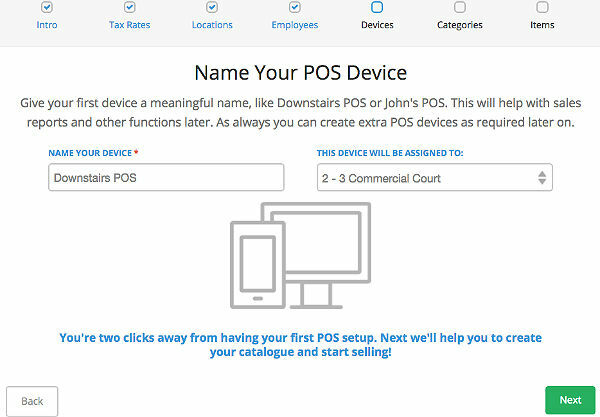 This will take you to the screen where you name your Till / Device and assign it to a location. 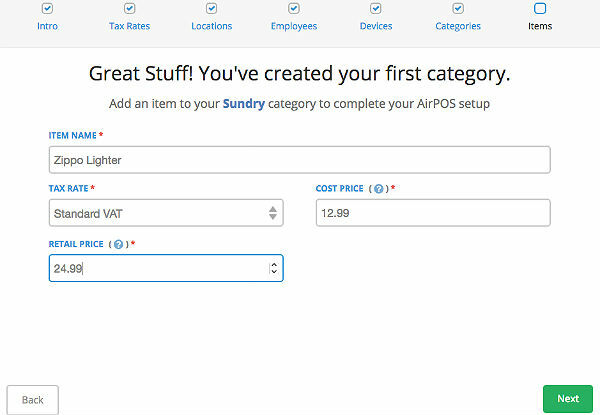 Press next and you'll be prompted to create your first category. Press next and you will be able to create your first item. 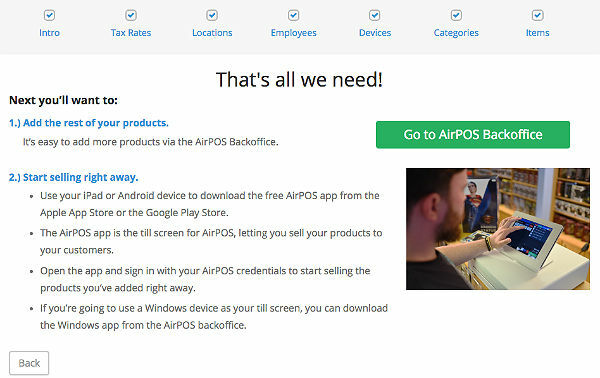 Press 'Next and you'll be prompted to go to your AirPOS backoffice. Here you can add more items and categories. Please have a look at the following articles. In the backoffice if you tap on your company name at the top right of the screen and tap or click on 'Edit My Account' you can edit the company name, the email address and password, timezone and close your account. 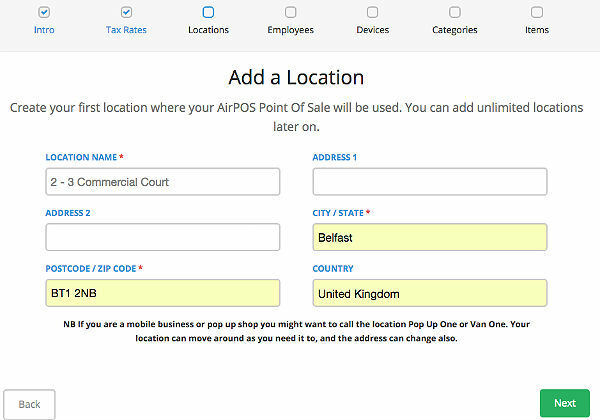 If you tap on POS from the left navigation margin you can add and edit your employees, locations, tax rates and devices.